Paul Adkins reports today that his saddle and seatpost were stolen off his bike sometime between 9 a.m. and 2 p.m. today at 1200 High St., while he was at work. I had a Brooks Team Professional (Honey w/hand peened copper rivets) and long silver Shimano XTR 27.2 post. I’m going to do my best to recover my parts. Not sure how I’ll do it. … The seatpost was securely fastened with a non-quick-release binder bolt and the thief took that too. Paul says he’s offering a reward. I don’t want to post his phone number here, but if you hear anything, e-mail me (eugenebicylist@gmail.com), and I’ll send you Paul’s phone number. I don’t really know Paul, but if Eugene has any celebrity urban cyclists, he is probably among them. He’s an advocate, he is part of a car-free family of six and you can learn more about him here. WACK. Brooks saddles stick out pretty hard around here, I’ll spread the word and keep an eye out. It is even worse. Attached to my seatpost was a custom handlebar mount for my kids riding the Xtracycle. I have 2 little kids that ride on my long tailed xtracycle everyday. So that was black with alloy handlebars. The only use for this would be for another xtracycle. I have to admit that I find it distressing that most of the expense on a bike is held on with nothing more than allen bolts.. I should ride a crappier commute bike, but since I tend to lock it only in my work bike cage and occasionally at the grocery store, I let it go… but the down side of that is that I’m a little less likely to use my bike for every-day stuff. In the thread about the new parking, I think there was something about money from meters funding bike parking infrastructure… it seems like it would be nice to have “super premium” theft-proof bike parking that cost money, but the money went towards more bike infrastructure. 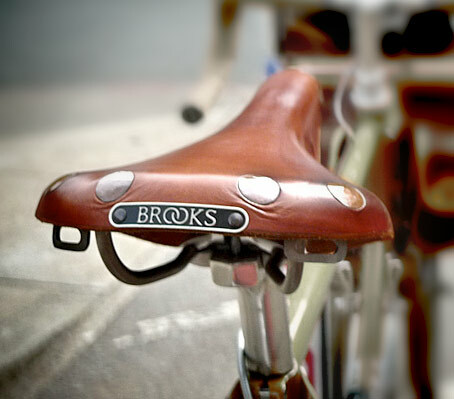 My wife’s bike was stripped of a brooks b.72 saddle from in front of her work. Also secured(?) with a non-quick-release binder bolt. I was a bit surprised since I figured that saddle thieves would be looking for carbon-type saddles. The lesson learned was to get a Bike Friday that her employer would allow her to store inside the building. Ugh. Tellin’ ya, a seat savvy thief is most likely walking around with a crescent wrench, not a crescent wrench and bolt cutters. Read the previous link posted, spend the time and conceivably zero dollars, and chain it up!